The historic telegram that is linked with General Antonio Luna’s assassination was just sold for P3.74 million in a recent auction held by Leon Gallery—an amount six times the original floor price of P500,000 (Read: Aguinaldo’s deadly telegram to Heneral Luna emerges in auction). According to a report, a lady who “sat at the far end of the room, who was on the phone bidding on behalf of a mystery buyer,” won the telegram, as well as Acta de Naic for P4.2 million, a military agreement signed by Andres Bonifacio that established a government separate from the one formed at Tejeros. Acta de Naic is signed by Andres Bonifacio and 44 men important in the revolution. The starting floor price is P1 million. Photo courtesy of Leon Gallery. Another important document sold was Acta de Tejeros, a document by Bonifacio and his supporters which questioned the election of Emilio Aguinaldo as president, for P3.8 million. “There was spirited bidding from three to four zealous Philippine history fans—fighting over the various papers as if they were Heneral Luna themselves. Each bidder had a very definite strategy. But like in any battle, only one can win,” Leon Gallery curator Lisa Guerrero-Nakpil said. When it was announced weeks before that the telegram will be up for sale, Guerrero-Nakpil said that the telegram, as well as Bonifacio documents and the Tinio Brigade dagger, has since been visited by society matrons and millennial students. To give you a quick background, the telegram dated June 4, 1899 was sent by Emilio Aguinaldo summoning Luna to Cabanatuan to discuss “urgent matters.” Historian Ambeth Ocampo says that this was just one out of the four telegrams sent to locate and trap Luna. 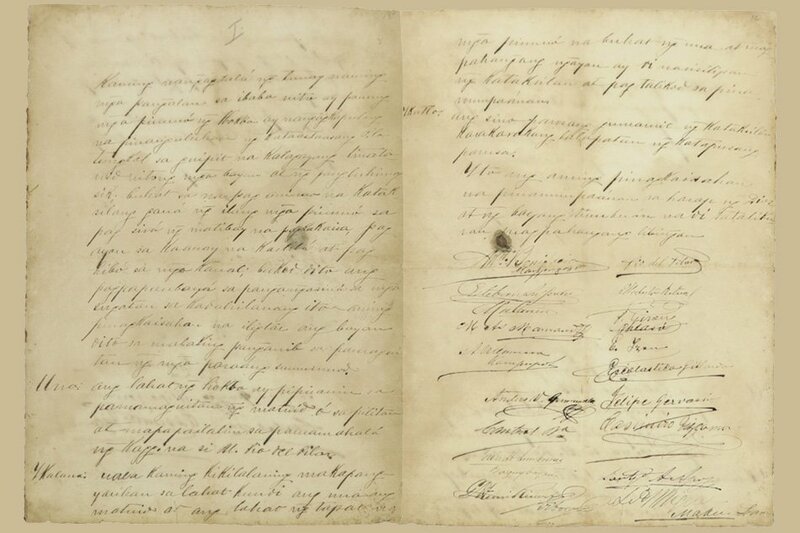 Originally written in Spanish, the handwritten telegram reads: “PRESIDENT OF THE REPUBLIC TO THE SECRETARY OF WAR, DAGUPAN : Paging for an important meeting, therefore you are ordered to come here immediately. This is in response to your previous telegram about urgent matters to discuss. It is really an emergency.” Photo courtesy of Leon Gallery. 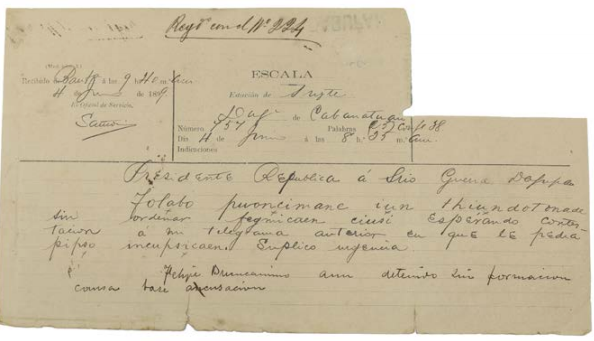 The telegram also features a clipped portion on the upper right corner, signifying that Luna received the telegram. However, historical accounts say that Aguinaldo never made it to the meeting as he was away for more important business. According to Ocampo, Luna instead caught sight of Felipe Buencamino, whom he ordered arrested for treason, and Aguinaldo’s bodyguards, whom he previously disarmed for insubordination, roaming around the Cabanatuan headquarters. This enraged Luna, threatening them to return with more soldiers and arresting them himself. But before he could even finish his threat, Luna was already left bleeding on the ground, assassinated by Aguinaldo’s men allegedly for “self-defense.” Aguinaldo vehemently stood his ground, saying that he never sent the telegram and wasn’t responsible for the general’s death. It was only recently when the mysterious telegram was unearthed in Luna’s family belongings. Luna’s response to the telegram, saying “Felipe Buencamino not yet detained based on my accusation.” Photo courtesy of Leon Gallery. National Historical Commission of the Philippines acting Executive Director Ludovico Badoy has since called on to Leon Gallery to hold the auction of prized documents such as the telegram so the government can buy them instead. If the government can’t do anything about it, let’s just hope that these mysterious buyers would share the artifacts with the rest of the country, instead of keeping them in an enclosed glass in the confines of their home. Header image courtesy of Leon Gallery.